At MairiMeDance we pride ourselves on making every couple as comf ortable as possible. We know the whole idea of getting up to perform in front of family and friends can be very daunting, but there is nothing to worry about, MairiMeDance creates dances that are tailored to each couple, so if the groom to be goes weak at the knees at the thought of dancing in front of an audience or is scared his mind will go blank, we can choreograph a dance that makes the bride do most of the work, but the groom still takes a lead role within the dance, making the whole performance look impressive. I am not a traditional ballroom dance teacher,( although can teach each style), so my choreography is a lot more relaxed, very subtle and not as choreographed as some other companies may provide. Whether you have danced before or are complete beginners, we can help you have fun, be confident and shine on your special day. Depending on your song choice, ability and expectations of your dance, we can create a dance you are confident with in an hour"s lesson, but generally will take around three or four. We provide free, no obligation consultations where we can discuss all aspects of your dance. If you are still undecided between a couple of songs, I would be happy to demonstrate some steps to give you a better idea of how your dance would look. From here, if you are happy to continue with lessons, we can decide on when to start and the number of lessons we think will be required. 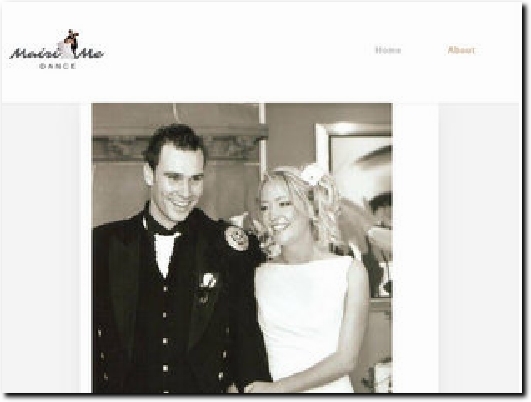 An Ayrshire-based widely-experienced dance teacher who has choreographed a first dance for over 400 couples. About tells you more about Mairi and What We Do tells what she can do for you. Hints and Tips gives advice on choosing your first dance song and a list of songs you might consider, and Testimonials has comments from past clients. Contact has her postal address, phone and e-mail details and an enquiry form.